Fire and Brimstone in Hell was first published in 1670. Psalm 11:6 Upon the wicked he shall rain snares, fire and brimstone, and an horrible tempest, this shall be the portion of their cup. Yet since we are capable of understanding such future things only by shadows and representations, and nothing can represent future burnings in hell so well, as the greatest burnings that have been upon the earth, therefore we may receive some help by the relation of Sodom and Aetna's storms and streams of fire and brimstone, to conceive something of those, whereby the wicked in hell shall eternally be tormented. Doctrine. That an horrible tempest of fire and brimstone, God will rain upon the wicked in hell, as their deserved portion. Fourthly, Who are the persons that shall eternally burn in these flames. Sixthly, And lastly, And chiefly I shall endeavour to improve this doctrine in some uses. The blind heathen were persuaded of this; for however they were ignorant of Christ, and his first coming to redeem the world, as also of the resurrection, and his second coming to judge the world; yet by the light of nature and reasonings from thence, they arrived at the understanding of a Deity, who was both just and good, as also that the soul was immortal, and that both rewards and punishment were prepared for the souls of men after this life, according as they were found, either virtuous or vicious; and therefore as they did feign such a place as Elisian Fields, where the virtuous should spend an eternity in pleasures: So also a place called Tartarus, or hell, where the vicious and impious should be eternally tormented. This Tartarus the poets did set forth with many fictions, to frighten people from vicious practices, such as of the four Lakes of Acheron, Stix, Phlegethon, and Cocytus, over which Charon in his Boat did ferry over the departed souls; of the three Judges Aeacus, Minos, and Rhadamanthys, who were to call the souls to an account, and judge them to their state; of the three furies Tisiphone, Megaera, and Alecto, who lashed guilty souls to extort confession from them: of Cerberus the dog of hell with three heads, which would let none come forth, when once they were in; and of several sorts of punishment inflicted, iron chains, horrid stripes, gnawing of vultures, wheels, rowling great stones, and the like. And Virgil described this place, which he feigneth Aeneas to have visited (Lib. 6. ), as a place where wickedness is punished, a place of fiery streams where the noise of chains, cruel lashes, groans, and cries are heard day and night. Although most of these things which we may find in many poets, and other heathen authors are fictions of their own brains, yet that there is such a place as hell is real, and the punishment real, and far beyond whatever any of the heathens could imagine it to be. Therefore let us consult the Scripture, which will give clearer light in this thing, where God, who has made and prepared hell for the wicked, has made known the thing, and threatened to punish the wicked there everlastingly. Look into the Old Testament, Psalm 9:17. The wicked shall be turned into hell, and all nations which forget God. I know that the original word for hell signifies the grave; but here it must have a further signification than that of the grave, since it is appropriated unto the wicked, and such as forget God, otherwise, it might as truly be said, that the righteous shall be turned into hell, and those that remember and fear, and love, and serve God, for they shall be turned into the grave. So Isaiah 14:12, 13, 15. How art thou fallen from heaven (speaking of the king of Babylon,) O Lucifer son of the morning, thou hast said in thine heart I will ascend into heaven, and exalt my throne above the stars of God; yet thou shalt be brought to hell, to the sides of the pit. That hell here is not to be understood of the grave only, but of the place also where the wicked shall be tormented will appear, if you compare this place with Isaiah 30:33, where the prophet speaking of the same king of Babylon says, Tophet is ordained of old, yes for the King it is prepared, he has made it deep and large, the pile thereof is fire and much wood, the breath of the Lord like a stream brimstone does kindle it. Which description is applicable unto no place, but that place of everlasting burnings, which the Lord has prepared for the wicked. Indeed Tophet was a real place upon the earth, where some idolatrous Israelites did offer up their children in sacrifice to Molech; but here hell is called Tophet, in allusion to that place, because of the shrieks and cries which the damned shall make there are worse than the children did in Tophet, when they were sacrificed by their cruel parents. In the New Testament it is most clear that there is such a place as hell prepared both for the soul and body of the wicked to be tormented in, Matthew 5:29, 30. And if thy right eye offend thee, pluck it out and cast it from thee; it is profitable for thee that one of thy members should perish, and not that thy whole body should be cast into hell, and if thy right hand offend thee, cut it off and cast it from thee, for it is profitable for thee that one of thy members should perish, and not that thy whole body should be cast into hell. That this hell is not meant of the grave, into which the body shall be thrown is evident, because those who do cut off the right hand, and pluck out the right eye which offend, (that is mortify those offensive lusts, which are as dear and as hard to be parted with as the members of the body) shall be exempted and delivered from this hell, whereas none shall be exempted, though never so holy and mortified from the grave. Yes, and in this hell it is said that both soul and body shall be destroyed. Matthew 10:28, Fear not them which kill the body, but are not able to kill the soul: but rather fear him which is able to destroy both soul and body in hell. Now the soul is not destroyed with the body in the grave, as they both shall be (if they are wicked) after the resurrection in hell. Moreover this hell threatened by our Savior to those that don't cut off right hands, & c. will appear plainly to be the place of torment prepared for the wicked, by the description of it repeated three times, Matthew 9:43-48. To go into hell into that fire which never shall be quenched, where their worm dieth not, and the fire is not quenched. By the unquenchable fire we are to understand the fire which shall burn the body; by the never-dying worm, the worm of conscience, which shall eternally gnaw the soul. This hell is called a prison, I Peter 3:19, 20. By which also he went and preached unto the spirits in prison, which sometime were disobedient, when once the long-suffering of God waited in the days of Noah. By the spirits in prison, we are to understand the souls in hell, the souls of those wicked and disobedient persons in the old world, who would not give ear to the preaching of Christ by his spirit in Noah, and therefore a whole world of them were sent into the prison of hell together, unto whom are gathered the souls of all that since have died in their sins, where they are bound up in chains of darkness, and reserved unto the judgement of the great day. Hell is also called a place of outer darkness, where there is weeping and wailing, and gnashing of teeth, Matthew 25:30. It is called a furnace of fire, where all those that offend and do iniquity shall be thrown, Matthew 13:41, 42. It is called the great wine-press of God's wrath, where all the wicked shall be crushed to pieces under the exceeding and eternal weight of his wrath, Revelation 14:19, 20. But especially it is set forth as a place of fire of which in the next particular. Many have been the conjectures of divines, concerning the place where hell is. Some have thought it to be in the bowels of the earth, because it is spoken of as a place below, and called by the name of a pit, the bottomless pit, out of which the smoke and locusts did arise, Revelation 9:2; and in which Satan was bound and held as in a prison, Revelation 20:1, 2, 3, 7. And they have thought the pit spoken of in Numbers 16:33, into which, Korah, Dathan, and Abiram went down alive, when the earth clave asunder and swallowed them up, was the pit of hell into which both their soul and body together were immediately conveyed; and that which has the rather established such in this opinion has been, the vast quantity of subterranean fire, which they imagine to be in the bowels and caverns of the earth: others have rather thought it to be beyond this visible world; (which will pass away at the last day,) and removed at the greatest distance from the place where the righteous shall eternally inhabit. But the Scripture being silent as to this, whatever is spoken on this subject where hell is, must needs be only by conjecture, the Lord grant that none of us may know by experience. Our chief care should be that we may escape the punishment, and not be inquisitive about that which the Lord has not thought fit to reveal. Let it suffice us to know that there is such a place as hell, where the wicked shall be tormented. There is nothing that hell is described by in the whole book of the Scripture so much as by fire, and sometimes by fire mingled with brimstone. It is called fire, Matthew 3:10. Every Tree which bringeth not forth good fruit is hewn down and cast into the fire; hell-fire, Mark 9:47, It is better for thee to enter the Kingdom of God with one eye, than having two eyes, to be cast into hell-fire; a furnace of fire, Matthew 13:42. And shall cast them into the furnace of fire. It is called a place where the wicked shall be tormented with fire and brimstone, Revelation 14:10. And he shall be tormented with fire and brimstone, in the presence of the holy angels. A lake which burns with fire and brimstone, Revelation 21:8. And shall have their part in the lake which burns with fire and brimstone, which is the second death. I know that it is a great question amongst divines, whether the fire of hell, which shall burn the wicked will be a real fire, or a metaphorical fire. There are men of great name, who assert it to be a metaphorical fire only, and that because it is called a fire, prepared for the devil and his angels, who cannot be hurt by a real fire; because the worm which never dies is metaphorically taken for the everlasting gnawings of conscience; because the New Jerusalem, which is above is metaphorically described to be of pure gold, clear like glass, the foundations to be garnished with all manner of precious stones, and the gates to be pearls, Revelation 21:18, 19. And by the same reason, they say the description of hell in the Scripture is metaphorical: those that thus affirm the fire of hell to be metaphorical, are so far from lessening the torment hereby, which this fire will inflict, that they so much the more aggravate it, because that metaphorical fire, they say, will afflict more than if it were real fire; for as the glory of the New Jerusalem, that building of God made without hands eternal in the heavens, does far surpass all metaphors, whereby it is set forth. These metaphors are made use of only to help our understanding in the conceiving of it's glory. So also the pain and torture of the damned in hell, will be more horrible and intolerable, than if they were to be cast into Nebu-chadnezzar's fiery furnace, when it was heated seven times more than it was wont to be heated; insomuch as the metaphor does come far beneath the thing, which it is used to set forth. Others are of the judgement that hell-fire will be real fire, it being so positively, so plainly, and so frequently asserted to be fire, fire with flames, fire which shall burn, and because nothing will put to greater pain than fire, and because it is proper for the body to be tormented with some real material substance. And when the holy Ghost tells us it shall be fire, why should he turn this fire into a metaphor, which may tend rather to weaken our conceptions of it's horrour than to heighten them. And therefore in answer to that great objection, that it is said to be prepared for devils, they are ready to say, it shall be such fire as will not only torment the soul, but also devils too, God having power to make such a fire. The other metaphors are made use of but once, this of fire is the almost constant expression in Scripture, where hell is described. I confess that I do not judge these answers to be fully satisfactory, for however the souls of wicked men and women may by sympathy with the body be tormented by real fire, yet God having made devils to be wholly spirits which are wholly incorporeal, I don't apprehend how any fire or bodily substance can have any impression upon them, but that fire, air, earth, or water, are all the same things to them and that they are incapable of suffering by any of them, that as water cannot drown them, so neither can fire burn them, that as air cannot refresh them, so neither can fire afflict them. Indeed were the opinion of some ancients true that devils have bodies, but more pure and refined, such as cannot be seen any more than the air, a real fire might be made so pure by God as to torment the devils. But I am altogether of the judgement that devils are wholly spirits, the Scripture asserting it, and many reasons I might give of it, but that it would be too large a digression. Moreover the fire of hell I believe will be such as immediately to afflict the souls of the wicked, and not only by sympathy with the body, because otherwise the torture of the body would be greater from it's immediate object, than the anguish of the soul by sympathy, when the soul's desert of punishment is greater, being more highly guilty of sin than the body which is made use of only as an instrument. Yet I cannot be of the opinion that the fire of hell will wholly be metaphorical for the reasons before given. Therefore I judge that both the opinions may be reconciled with themselves and the truth, by asserting that this fire of hell will be partly metaphorical and partly real. First, I conceive that the fire of hell will be in part metaphorical, and that this also will be the most grievous and tormenting, though not to the sense, yet to the soul and to the devils, who can be tormented by no other fire. My meaning is that the fire which will be metaphorical, is to be understood of the fierce anger and wrath of the sin-revenging God, who himself is called a consuming fire, Hebrews 12:19, and whose anger is often expressed by the metaphor of fire in the Scripture. And so that everlasting fire prepared for the devil and his angels, and for the souls of wicked men and women, (which will be accompanied also with a real fire, prepared for their bodies, of which in the next particular) is the everlasting wrath of God, which he has treasured up against the day of wrath, when he will open and bring forth those treasures, and make immediate impressions thereof upon all damned spirits, which shall burn worse than fire, and cause greater anguish to the spirit, than any fire can do to the sense. Hence it is said, Hebrews 10:31, It is a fearful thing to fall into the hands of the living God, and that because the immediate strokes of God's vengeance, which damned spirits shall fall under, when he takes them into his own hands to punish them in hell, will above all things be most intolerable. The Apostle says in II Thessalonians 1:8, that the wicked shall be punished with everlasting destruction from the presence of the Lord, and from the glory of his power. This is to be understood causally; as if he should have said, that the destruction of the wicked shall arise from God's presence and glorious power, which shall put forth itself so mightily, as to glorify itself in the punishment of them in hell. God will appear in heaven to the angels and saints, in a flame of love, and make immediate and most sweet impressions thereof upon them, which will be their chief happiness. And God will appear in hell to devils and damned spirits in a flame of wrath, as a consuming fire, and make immediate impressions of his wrath upon them, which will be their chief misery. For sinners to be taken thus into the hands of God, and punished by the fire of his wrath will be more dreadful, than if the most furious creatures in the world were mustered up together, and let loose upon them to tear them in pieces and devour them. If they were tormented with the most exquisite torments, which can possibly proceed from any second causes, it would be no more than the biting of a flea, or the prick of a pin in comparison with these immediate strokes of God's vengeance, and the burning under the fire of his indignation. Secondly, The fire of hell I believe will be in part real, I mean that fire whereby the body shall be afflicted, I judge that as the torture will be real, so that the fire whereby it will be tortured will be real too. Of all senses the feeling is most capable of being cruciated and afflicted, and of all the objects of this sense fire is most afflictive and painful, and therefore God has appointed fire to be for the punishment of the body. Indeed other senses will be afflicted too, the ear with hideous noises, shrieks, and yellings of fellow damned sinners; the eye with fearful ghastly and horrible spectacles; the smell with suffocating odious and nasty stench, worse than of carrion, or that which comes out of an open sepulchre. But the feelings will be most afflicted by the devouring and eternally burning fire, which the wicked shall be thrown into. There are seven properties of hell-fire. First, The fire of hell which shall burn the wicked will be a great fire. We have seen some great fires, which have burned many houses together, such as that in 1666 which burned down the greater part of London. But this fire of hell will be so great, as to burn all wicked persons together, all the wicked will be in flames at the same time. The greatness of this fire is set forth, Isaiah 30:33. Tophet is prepared of old, he hath made it deep and large, the pile thereof is fire and much wood, the breath of the Lord, like a stream of brimstone doth kindle it. Tophet does signify hell, the place where the damned shall be tormented, of which before. God has made it deep and large. The depths of the earth, or the depths of the sea are nothing in comparison with the depths of hell; for those depths have a bottom, but this is called the bottomless pit, Revelation 20:1. It is deep and large, of vast capacity. It will be sufficient to contain all the sinners of the old world, and all the sinners of this world who have lived or shall live in every generation until the time of the world's dissolution. The pile thereof is fire and much wood. 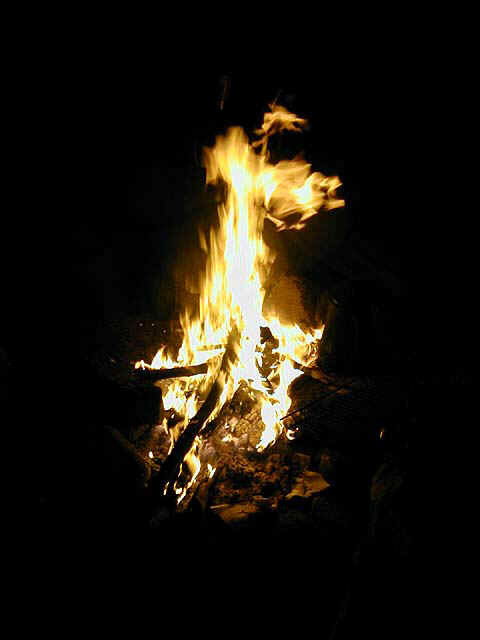 As much wood being kindled does make a great fire, so this fire though it have no real wood, but that which will be equivalent, will be very great, especially being kindled by the breath of the Almighty. As the breath of the Lord kindled those showers of fire and brimstone, which came down from heaven upon Sodom and Gomorrah, so the breath of the Lord will kindle those streams of fire and brimstone which shall be in hell. Secondly, Hell-fire will be a dark fire. There will not be the least glimmering of light in that doleful place, which will add to the horrour thereof. Hell is called by the name of outer darkness, Matthew 25:30. It is called blackness of darkness forever, Jude 13. There will be no light of God's countenance, not the least smothering of his brow. His wrath will be poured forth without mixture into the cup of his indignation which they must drink of, Revelation 14:10. There will not be the least light of comfort, nothing but weeping and wailing and gnashing of teeth; there will not be the light of the sun, or the moon, or the candle, and the fire itself will give no light, all will be dark and black, black devils, black bodies, black souls, and they may without light have perceivance one of another, as devils have now unto whom light is of no use; or if there be a duskish light there, to represent one another's rueful countenances, and other frightful spectacles. Be sure there will be no refreshing light. There the damned will be in a place and state of darkness forever. Thirdly, Hell-fire will be a fierce fire. The fire of Sodom, of Aetna, yes, of London in the day of it's burning was fierce, but no fire burns so fierce as hell-fire will do. The fire of God's anger and wrath will burn fiercely. Now it does but smoke against sinners, then it will break forth into a flame. Tongue cannot express how fiercely the wrath of God will burn, when hereafter it shall seize upon the ungodly, Psalm 90:11. Who knoweth the power of thine anger? even according to thy fear so is thy wrath. The power of the anger which any creature may have, may be known. It is finite. It is limited. It reaches no further than the body; but who knoweth the power of God's anger? it being infinite, and unlimited, and such as will reach the soul, and most grievously torment the soul through it's immediate impressions. According to thy fear so is thy wrath, that is according to the fear which we may have of thee. The wrath of man is not proportionable unto the fear which we may have of it. We often fear that men can do more than they are really able; but the wrath of God is commensurate and proportionable unto the greatest fears thereof, yes does far exceed them. He can afflict more than our fears are able to conceive, and that because of the infinite power of his wrath. God will hereafter make the power of his wrath known, as Romans 9:22 and how fiercely then will it burn? The fire also which will torment the bodies of the wicked will be very fierce. It will be so fierce, as to torment every part from the crown of the head unto the foot, and every part in extremity, in the utmost extremity, and that beyond the present capacity. Fifthly, Hell-fire will be a continual fire. Other fires sometimes are in, and sometimes out, but this fire will be always in, always burning without any intermission, and always burning in the same high degree of intention. There will be no assuagement of the flames of God's anger, no abatement of the fire of hell. This fire will be always alike hot, and always hot in the highest degree. Seventhly, Hell-fire will be an everlasting fire. Matthew 25:42, Depart from me ye cursed into everlasting fire, prepared for the devil and his angels. Revelation 14:11, And the smoke of their torment ascendeth up for ever and ever. This fire will be ever burning, and the damned will be ever tormented therein. Extremity and eternity are the two most bitter ingredients of the damned's torments. Who can set forth the eternity of the wicked's punishment in hell-fire? This eternity is immeasurable. It is incomprehensible. All the rays of the sun may more easily be comprehended in a small room, and all the waters of the sea contained in a small nutshell, than boundless eternity be conceived by our finite and shallow understanding. None have shadowed eternity, and set it forth better than those who have shown how infinitely short all measures and numbers do fall, when they are applied to the space of it's duration. One expresses himself thus on this subject in another language: suppose ten thousand years past, after that an hundred thousand millions of years past, after that ten hundred thousand million of millions of years past, and yet you are not come to the end of eternity, no nor to the middle of eternity; yes, you are but at the beginning of it. Add unto this the number of all the thoughts of angels and men, of all the motions in every creature, of all the grains of sand which would fill ten thousand worlds; gather all the minutes of time, from the beginning of the creation of the world, all the numbers of arithmetic that can possibly be conceived, and all this is but the beginning of eternity. How long will eternity last? Always. When will eternity end? Never. As long as heaven shall continue to be heaven, and God shall continue to be God, and the saints shall be happy in the enjoyment of God, so long shall the wicked be tormented in the fire of hell. We may apprehend the everlastingness of this fire of hell, but we cannot comprehend it. It is upon the wicked that the Lord will rain this horrible tempest of fire and brimstone in hell. All the workers of iniquity, all that live and die in their sins, must suffer the vengeance of eternal fire. These are the chaff which shall be cast into the unquenchable fire, Matthew 3:12. These are the tares which shall be bound up in bundles to be burned, Matthew 13:30. These are the goats which shall be condemned to everlasting fire, Matthew 25:41. Look into a few places where in the plain letter of the Scriptures, the persons are described, that shall be the subject of everlasting torment in hell-fire. Matthew 13:41, 42, The Son of Man shall send forth his angels, and they shall gather out of his Kingdom all things that offend, and them which do iniquity; and shall cast them into a furnace of fire, there shall be wailing and gnashing of teeth. Romans 2:6, 8, 9, Who will render to every man according to his deeds, to them that are contentious, and do not obey the truth, but obey unrighteousness, indignation and wrath, tribulation and anguish upon every soul of man, that does evil of the Jew first, and also of the Gentile. II Thessalonians 1:7, 8, 9, The Lord Jesus shall be revealed from heaven with his mighty angels in flaming fire, taking vengeance on them that know not God, and obey not the Gospel; who shall be punished with everlasting destruction, from the presence of the Lord and the glory of his power. Take one place more among many, Revelation 21:8, But the fearful and unbelieving, and the abominable, and murderers, and whoremongers and sorcerers, and idolaters, and all liars shall have their part in the lake, which burns with fire and brimstone. I shall speak more of the persons when I come to the application which I would chiefly insist upon, the Doctrine being so well known, and therefore I shall but briefly touch upon the reason, why the wicked shall be eternally tormented in the flame of hell, and so come to the Use, which I mainly intend. The torment of the wicked in hell is a punishment, and therefore has a respect unto sin, the guilt of which does lay the wicked under an obligation hereunto, and lays God under an obligation to inflict this punishment upon them. Sin is the violation of a holy and righteous law; and an offence of an Infinite Majesty, whose justice requireth infinite satisfaction, which it can receive no other way from sinners themselves, than by their undergoing the punishment of hell. Although this punishment is not infinite in regard of the quality, yet it is infinite in regard of it's duration, and therefore the torments of the wicked shall have no end. When you had the relation of Sodom and Gomorrah's burning, you might think this was done long ago, and look upon yourselves as unconcerned. When you had the relation of Aetna's burnings, you might think this was done afar off, and look upon yourselves as unconcerned. But when you come to discourse of hell-burnings, here you all are concerned. Those burnings are past, these are burnings to come. Those were burnings for a while, these will be burnings forever. The greatest part of the children of men will be cast into these burnings, and very few comparatively will escape. Oh, what a vast number of all kindreds, and nations, and languages will there be tormented forever in hell! What a vast number of Christians, yes, of professors of the Gospel! You had need to look to it, that none of you be found in the number. diligence, to enquire whether you are in danger, and what you might do to escape. The most men and women that live this day upon the face of the earth are in danger of being thrown into the flames of hell. The whole world may be divided into two parts, they are either such as are in a state of nature, or such as are in a state of grace. The former are many thousand times the greater number, and the Apostle tells us expressly that such are children of wrath, Ephesians 2:3. And if children, then heirs; the children of God are heirs of heaven; the children of wrath, who also are called the children of the devil, are heirs of hell. The latter only (I mean such as are in a state of grace) are in a state of salvation, they only are free from all obligation to the punishment of hell, having interest in Christ's satisfaction. There are two ways, in one of which all the sons and daughters of men may be found, Matthew 7:13, 14. One is a narrow way, which has a strait gate, and very few are to be found therein, and that is the way of holiness, of self-denial, of mortification and Gospel-obedience, and although this is the way of life and salvation, the way to glory and honour and everlasting happiness, yet it has but few passengers, few take this course. The other is a broad way, which has the greatest crowd and throng although it leads unto destruction. And this is the way of sin, the way of profaneness, licentiousness, unrighteousness, disobedience. This is the course of the world. This way has a wide gate, and many there be that go in thereat. And the reason our Savior gives, because the other way has so strait a gate, because of the difficulty of it's passage; namely, the wicket of regeneration. Few attempt to go through this strait passage, or if they do attempt, they are quickly discouraged with the difficulty, and so let it alone, taking the broader, because the easier way of sin, the steps of which will certainly take hold of death and hell. I beseech you all with the greatest seriousness to examine yourselves, whether you be in a state of nature, or in a state of Grace? You have been all born once, have you been born again? You have been born of the flesh, have you been born of the spirit? You have born the image of the earthly Adam, do you bear the image of the heavenly Adam? You are partakers of the human nature, are you partakers of the Divine nature? Have you new and clean hearts? Are they changed? Do you lead new and holy lives? Are they reformed? I beseech you examine which of the two ways you are walking in: is it the broad way of sin and wickedness, or is it the narrow way of faith and holiness? These are questions of great moment to be resolved in, your everlasting weal or woe, your salvation or damnation does depend upon them. If you be brought into a state of grace, and are got in through the strait gate, into the narrow way, you are made men and women happy you that ever you were born, you not shall perish with the wicked, but most assuredly attain eternal life and glory. But if you are in a state of nature, if you are in the broad way, and continue therein to the end of your lives, you are undone men and women, woe be to you that ever you were born, heaven will be shut upon you, and hell will be opened unto you, where you shall be unconceivably and eternally tormented in the flames of that unquenchable fire. Take heed that you do not mistake your state and way. Thousands have gone to hell through a mistake. It is very easy to mistake. It is difficult not to mistake, and no mistake is worse than this mistake. All is not gold that glitters. All is not grace, that has the show of it. All are not in the way to heaven that pretend to it. Many deceive others much and deceive themselves much more. Nothing is likely to hinder you more effectually from attaining grace than ungrounded conceits that you already have it. If you should nourish in yourselves a false faith, and false hope, they would be so far from saving you, that they would fasten you the more strongly in Satan's chains, whereby he will the more unperceivably and inevitably drag you into hell. And think if you should go out of the world, under a mistake with fair, but groundless hopes of heaven, and shall find yourselves unalterably judged by God unto hell, how this will render the loss of heaven the more bitter, and the pains of hell the more grievous; the disappointment of happiness, especially so great happiness, and to be overtaken with misery, especially so great misery, and that when all means are cut off forever, of attaining the one or avoiding the other, this will be unspeakable vexations. And let me tell you, that it is better to be mistaken on the other hand than on this. It is better to fear when you are gracious, than to hope when you are ungracious. A dangerless fear is better than a fearless danger. The former may cause you to go droopingly for a while towards heaven. The latter if it cause you to go merrily, it will also cause you to go securely and surely to hell. I need not spend time (neither may I lest this volume swell to big) in telling you that idolaters, and adulterers, and drunkards, and swearers, and blasphemers, and scoffers of religion, and persecutors of God's people, and thieves, and murderers, and liars, and apostates, and profane persons, and all the more notorious workers of iniquity shall have their part in the lake which burns with fire and brimstone; amongst whom if any of you who cast your eyes upon these lines be numbered, and your conscience with a slight reflection do accuse you herein, give me leave to hold you a little by the arm and ask you why so fast? What means this hurry? Why so furious? What means this eager pursuit of lust? Do you know whom you serve and do you think what your wages will be? Do you know what is before you? Do you see the end of a sinful course? Do you know what hell is? Is it desirable to dwell with devouring fire? Do you think to escape in this way? But the awakening Use is afterward. But let me beseech you that are more sober, and although professors of religion, to examine your state. Take heed you do not deceive yourselves, and thereby undo yourselves irrecoverably. Have you been under convictions of sin? And these followed with contrition(!) and that backed with sound humiliation, such as has rendered sin above all things most odious, and yourselves of all other persons most vile in your own eyes? Have you had conviction of Christ's righteousness! and this working hungering desires after him, and these accompanied with faith, and that bringing you to Christ, choosing him as most precious and needful for you, casting yourselves upon him, with a renouncing of your own righteousness, accepting of him and his righteousness; resigning up yourselves unto him, putting your neck under his Yoke? Have you received the spirit enabling you to pray, mortify sin, and quickening you unto all the duties of new obedience? Hereby you may know the change of your estate. If your hearts remain unhumbled, unbroken for sin; if you are strangers unto the work of faith, and never truly closed with Jesus Christ; if you are without the spirit of Christ, and under the power, the reigning power of any sin; if you live in the neglect of prayer secret and with others, and of the great salvation, which the Lord Jesus has purchased, if you have a form of godliness but are without the power thereof, you will be found foolish virgins at last, which will have no admittance into the bride-chamber. You will be found hypocrites, whose portion is the burning lake, and it will be impossible for you to escape the damnation of hell. Hebrews 2:3, How shall we escape if we neglect so great salvation? Are the burnings of hell so certain, being threatened by God! are they so dreadful, beyond any burnings that ever have been, both in regard of fierceness and duration? And are they indeed prepared for the wicked, and all graceless, Christless persons as their deserved portion? And are most of the children of men wicked, ungracious, unrighteous, unregenerate, unbelievers, who are already condemned to this place of torment (John 3:18)? And by consequence every moment are such in danger of being dragged forth to execution? Here then we may sit down, and wonder at the senselessness and carnal security of such persons, especially of those who sit under the light of the Word, which does make discovery of all this most plainly unto them, whatever their danger be, whatever their sins which have deserved hell, whatever God's threatenings of everlasting burnings, whatever execution there is, and has been upon other sinners like themselves, yet they are without any fear, they are fast asleep in sin and very secure. Though their conscience be full of guilt, their hearts full of lust, their lives full of sin, though their steps are carrying them forward in the broad way, which leads unto destruction; though death has them upon the chase, and is at their heels, though the wrath of God pursues them hard, and is at their backs, though the day, wherein they must give an account, and be punished for their iniquity hastens greatly, and the Judge stands at the door; yet they care not, they fear not, none of these things do move them, none of these things do trouble them. They eat and drink, and sleep, and buy and sell, and plant and build, and go on in a sinful course, as if they should live here eternally, or as if their soul should perish with their body, and all these things foretold in the Word, concerning future retributions were but nicer fables. First, Some are thus secure, through an atheistical persuasion that there is no God. Because they are enemies unto God, and live in a course of rebellion against him, and so it is their interest and desire that there should be no God. Therefore they do what in them lyeth to work themselves unto this persuasion. There are too many in our age who endeavour to wear off all sentiments of a deity from their minds, that they might sin freely without any check and control, that hereby they might arm themselves against the thrusts and wounds which the sword and arrows of God's threatenings would otherwise give unto them, and that by this means they might still the noise of their clamorous and accusing consciences, which otherwise would give them no rest under such heaven-daring provocations, as they daily are guilty of. But such persons, if they will not believe the engravings of God, which are upon the face of the universe, the impress of infinite power, and an invisible Deity on his works, which are visible unto the eye, they shall not remain long under their atheistical apprehensions but he will make them to know and feel that there is a God by the immediate impressions of his wrath upon their souls, and the dreadful flames of hell-fire, which his breath will kindle to burn their bodies everlastingly. Secondly, Others are secure, notwithstanding their danger, through a fond persuasion that there is no hell, that there is no account to be given, no judgement to be passed, no punishment to be endured after this life, but that death puts a total end to their being, and that forever. We read in the Book of Wisdom, chapter 2 of the reasonings which such have: Our life is short, and in the death of a man there is no remedy, neither was there any man known to return from the grave: For we are born at all adventure, and we shall be hereafter, as though we had never been; for the breath in our Nostrils is as smoke, and a little spark in the moving of our heart; which being extinguished our body shall be turned into ashes, and our spirit shall vanish as the soft air: our life shall pass away as the trace of a Cloud, or like a Mist driven by the Beams of the Sun; our time is a very shadow that passeth away, and after our end there is no returning, for it is fast Sealed that no Man cometh again. Hence they are secure and encourage themselves in wicked and licentious practices, Come on therefore let us enjoy the good things that are present, let us fill our selves with costly Wines and Ointments, and let no flower of the spring pass by us; let us crown our selves with Rosebuds before they be Withered, let none of us go without his part of our voluptuousness, for this our portion and our lot is this. Such persons they live like beasts, and they would persuade themselves that they shall die like beasts, that there is no immortality of the soul, that there will be no resurrection of the body, and by consequence no punishment of both in hell; whereas right reason will evince, that the soul being a spiritual substance will survive the body, which the wiser heathens have acknowledged. And the Scripture does clearly reveal this, and that the body shall be raised again at the last day, and both the soul and body of the wicked be eternally tormented in hell; which Scripture being the Word of God, which no carnal reason could ever yet disprove, these things are as certain as God is true. Sixthly, Others are quiet and secure through want of serious consideration, what their guilt and danger is. They fill and throng up their time so full with worldly business and secular employments that they leave themselves no room or leisure to think of sin and their near-approaching death, and future wrath, and the eternal burnings of hell, which they are in danger of. The cares of this world and the deceitfulness of riches do choke their meditations in the first springing forth of them that no fruit does come from them to perfection. Did but guilty sinners sit down one quarter of an hour every day, and look upward to the angry God who frown upon them, and downward to the flames of hell, which are preparing for them, and forward to the last judgement, when they will be sentenced by the Judge to dwell with devouring fire, and inhabit everlasting burnings; and were persuaded that if they continue in sin, they can be no means escape; surely they could not be so secure. How long will you sleep oh you sinners? How long will you slumber in such imminent danger, you graceless and Christless persons? What sleep under the light? What sleep upon the brinks of the burning lake? And will nothing rouse you, and awaken you out of this sleep? Are you resolved it shall prove the sleep of death? Shall it insensibly and effectually usher you to hell before you are aware? Have you been called already so long, so loud, so frequently, so fervently, and yet do you deafen your ear? Have you been told so often of your guilt and danger, and yet harden your heart? Yet will you hold fast your sins, resolving not to let them go whatever they cost you? Have your hearts been like so many brazen walls, beating back all the arrows of reproof, and threatenings which have been shot at you or are they like clay and mud, which grows the more hard and obdurate under the sun and light of the gospel which has shined upon you? Have no heavenly dews and showers of the Word yet melted and softened you, no fire and hammer new-moulded and framed you? Have you been threatened with death, and wrath, and misery forever, and yet not startled, yet stupid and senseless? Oh, that yet at length you might be awakened, and by the spirit of the Lord effectually persuaded to lift up your eyes, and look a little before you, Yonder, Yonder! Look sinner yonder is a horrible burning tempest driving towards thee, a dreadful burning lake preparing for thee, but you cannot see it; look through the perspective of Sodom's burnings, when fire came down from heaven, and Aetna's burnings when fire came forth of the earth, and this will discover something. But the perspective of the Word will show it plain; if you look upwards with this perspective, you may see some glimpse of the glory of heaven, and if you look downward with it, you may see some glimpse of the fire of hell. Look do you not see a horrible deep and large pit filled with horribly burning fire, and that fire filled with damned men and women? Lay your ear to the mouth of this pit, and hear what the dolorous complaints, what the shrieks and yellings be of that cursed company. And do you not perceive yourself hastening forward in the way to this place of burning? And will you go forward still? Will you suffer yourself to be carried on furiously by your impetuous lusts, until you are fallen into this pit, and there is no possibility of ever getting out again? But more particularly I shall lay before you some considerations for the awakening of the secure. First, Think how doleful a day of trouble and adversity is like to be to you, if you be then in danger of hell, where will the quiet and security which now you have appear on that day? Possibly it may last and abide with you so long as the warm sun of prosperity does shine upon you, in the spring of youth and sensual delights, while you thrive and flourish in the world, while your friends and flatterers are about you, your health and outward peace does remain with you. But you may live to see all your outward comforts lie dead before you, and hidden in the grave from your sight forever. Your sun of prosperity may set at the noonday of your lives, and a black night of adversity may come upon you; stormy winds and a bitter cold. Winter of trouble and affliction may assault you, and wither all your sensual pleasures like the herb and flower of the field. Some unlooked-for-providence may blast your estate, and your name, bereave you of your dearest friends and relations, and withdraw all the fuel and provisions which you have been storing, and laying up for your flesh and sensual satisfactions. How well and strong so ever you are for the present, an unexpected sickness and death-threatening distemper may suddenly invade you, and bring you down to the sides of the pit, and fill you with such pain and grief as no outward enjoyments shall be able in the least to aswage. And then think with yourselves, you that are in danger of hell, what dread is like then to seize upon you like an armed man, which you will not be able to resist. Then your carnal security will fly away like a bird or a cloud, and vanish like smoke in the air. Then your false peace will be broken and torn to pieces, like the spider webs by the fierce winds, as being utterly unable to resist the fierce blasts, and rougher assaults of an adverse estate. And oh how doleful and dismal is a day of trouble like to be to you, when all outward stays and comfort, and all inward quiet and peace shall fail together; when there are storms abroad, and worse storms at home; great trouble without, and greater trouble within; when you shall fall under the scourge of outward affliction, and under the lashes of an accusing conscience. The fear of hell and everlasting burnings is like to be more lively, and afflictive in a day of trouble, than when prosperity does restrain conscience from doing it's office. Secondly, Consider if you should escape the greater storms of outward affliction in your life, yet you cannot escape the stroke of death, and think how the apprehensions of future wrath and burnings are like to consume you with terrours at your latter end, Psalm 73:19. Death has a grim aspect, and looks with a fierce countenance upon guilty souls; and when this enemy shall assault and wound you, when your last sickness shall come and prove mortal to you; when the physician shall give you over and leave you, your friends shall mourn and stand weeping about you, when death has seized upon the extreme parts of your body, and the cold, clammy sweats are upon you, and then you apprehend the second death near you, which will immediately follow upon the first death, when you think that while friends are conveying your body to your grave, that devils shall drag your souls to hell; how are you then like to awake in horrour, despair and utter confusion? The dying sobs and groans of some guilt sinners, when awakened at their entrance in at the port of death are dreadful, but the inward anguish of the heart is beyond all compass and conceit, or expression of tongue. Thirdly, But think how fearful the separation of your souls and bodies will be. Think with what dread your spirits will appear before God, when your consciences shall furiously charge you with guilt of all the sins which ever you committed, and you have not one pardon to show, nor one word to answer for yourselves; when being examined and accused and found guilty, you shall be condemned unto eternal punishment. Think oh think what your horrour is like to be then. Fourthly, Think of the day of doom, when the Lord Jesus shall come. I mean when he shall come down from heaven to judge the world. When the graves shall be opened and you called forth to appear before him, and the book of your conscience shall be opened, and all your sins made manifest to the whole world, and having nothing to answer when you shall be sentenced to everlasting fire: Depart from me ye cursed into everlasting fire prepared for the devil and his angels, and when the Lord shall then drive you out of his presence into hell, O what will your shrieks and outcries be at that day? See my book of Christ's Certain and Sudden Appearance to Judgement. First, Think what in hell will be taken from you. All your riches will be taken away. Riches will then take the wing and be gone, and you shall never set your eye upon them any more. You shall never buy and sell, and get gain any more, never purchase houses and lands, and inheritance more, and not then have so much land left, as whereon to set the sole of your foot, all your money and estate will perish with yourselves, and oh how poor and miserable will you perceive yourselves then to be when you are deprived of all your riches and treasures on earth, and instead thereof are made to possess treasures of wrath? Your honour also will be taken away, and everlasting shame and contempt shall be poured upon you. Although you may be raised to a higher seat than the ordinary rank now, then you must stand upon even ground with the meanest, even such whom you would think scorn to set with the dogs of your flock, or to employ in the meanest office about you. The crown will then be plucked from the head, and the robe be torn from the back, and all the honour of wicked great ones be laid in the dust; and they will find no more respect in hell than other men. Wicked princes and noblemen, wicked knights and gentlemen will have none to bow to them there, and do them homage. And the most high-born ladies that are not new-born (whatever they have here) will find no courtship hereafter, but will be handled as roughly as the meanest of their attendants. All your sensual delights and pleasures will then be at an end, they are now but for a season, Hebrews 11:25, yes, but for a moment, Job 20:5. Sometimes they fail before the life is at an end. Be sure hereafter they shall have an eternal period. In hell there will be no feasting and delicious fare to pamper the flesh, no carousing and drinking wine in bowls, no chanting to the sound of the violin, no singing, dancing, and making merry. The glutton shall there have no sweet morsels, the drunkard no sweet droughts, no not so much as a drop of water to cool and refresh him. The wanton shall no more melt in lascivious embraces, nothing will remain of all your sweetnesses and pleasures here, but the bitter remembrances accompanied with unutterable grief and groans, and the intolerable sting and bitings of the never dying-worm of conscience, whatever you have prized and pleased yourselves with here. You will then be stripped of all, and oh how bitter will this be to lose all that which you now so much esteem and love, and place your chief happiness in? First, The soreness and intollerableness of it. First, Consider the soreness and intollerableness of hell's torments and think on both the pain which there you shall feel in your bodies, and of the anguish which shall be put upon your souls. If you be found amongst the wicked and ungodly at the last, your bodies shall be tormented in every part in the flames of hell-fire. No pain is more grievous now to the body, than the pain of fire. But what is the extinguishable fire on earth, in comparison with the unquenchable fire of hell? What is the fire of man's kindling in comparison with the fire of God's kindling? What is fire fed by wood in comparison with fire fed by the breath of God? No fire here can torment like to the fire which God has prepared for the bodies of the wicked hereafter. You have seen fiery ovens, and you have heard of Nebuchadnezzar's fiery furnace. Should your bodies now be thrown into such fires, you would find them horribly painful. But the pains of hell-fire will be ten thousand times more horrible and tormenting. Your bodies now cannot endure much pain, without expiring which puts an end there unto. But hereafter God will strengthen your bodies to endure. They shall have greater strength and quicker sense, and so more capacity for pain, and they shall be filled to the uttermost of their capacity. Your bodies shall never die, and they shall be filled with pain in extremity, and that to eternity. This will be very sore. All the tortures that ever were invented by the most mischievous mind, or executed by the most cruel tyrant on whom they have had the greatest spleen unto, are not so much as the least gentle touch in comparison with the torture which the least member of the damned shall endure in hell. Some of you have had extreme pain in your heads. Others have had extreme pain in your bowels. Others have been extremely afflicted with pain in your legs. Others have felt much torture with the pain in your teeth. But if you live and die in sin, you shall be extremely and eternally tortured with pain in every part. Your eyes shall be full of pain, your tongues full of pain, your hands full of pain, your heads full of pain, your backs full of pain, your bellies full of pain, your feet full of pain, from the crown of your head unto the sole of your feet, no part shall be free. Your bodies shall roll and tumble in flames, and there burn with horrible pain, and yet never be consumed. But the anguish of your soul will far exceed the tortures of your bodies, and here words fail, conceptions fall short. Who can tell how the worm of conscience will bite! How dreadful the lashes of your consciences will be, when they are let loose (as God's executioners) with full rage upon you? Who can utter the anguish you shall endure under the immediate impressions of God's wrath upon your souls. This will exceed whatever can be inflicted by the means of any second causes. The punishment of hell-fire will be very sore and intolerable. Such as are tender cannot without unutterable fear and grief bear the thoughts of being burned alive here on earth, and oh the shriekings of such persons, when they have been brought to the fire, and the flames have begun to seize upon them! Oh, I cannot endure it! Oh, I cannot endure it! How intolerable then will hell-fire be! Many martyrs have endured great tortures in their bodies with much patience, some were slain with the sword, some burned with fire, some scourged with whips, some stabbed with iron forks, some their skins plucked off while alive, some their tongues cut out, some stoned to death, some starved with hunger and cold, some dismembered and naked to the shame of the world; and yet in the midst of all their pains they have had a composed mind. Yes, sometimes have been filled with joy. God has not suffered man to inflict upon them more than he has given them strength to bear; but there will be no patience to undergo the pains of hell. The spirit will utterly sink under the heavy burden and pressure thereof, especially the pressure of that pure and weighty wrath, which shall be immediately upon the soul. The terrours of conscience here and forecasts of wrath are intolerable in this world, Proverbs 18:14. The spirit of man will sustain his infirmity, but a wounded spirit who can bear? If the body be infirm and weak, full of distemper and pain, yet while the spirit is whole and sound, while there is peace within, the spirit may sustain this, and bear up under it. But if the spirit be wounded by the arrows of the Almighty shot into it, who can bear it? If God let fall some scalding drops of his wrath upon the spirit, if he kindle a spark of hell-fire in your conscience, who can endure it? No balm, no physician on earth can cure such wounds. No earthly riches or sensual delights can aswage these inward griefs and horrours, which by the hand of God are imprinted upon the spirit: when the wicked are filled with dispairful agonies, through apprehension of future approaching wrath, and there remains nothing but a fearful looking for a judgement and fiery indignation, which shall devour the adversaries, Hebrews 10:26. This is enough to sink the heart of the stoutest under it's burden. And if the wounds of the spirit here are so intolerable, what will those be which the Lord with such mighty force and by his immediate hand shall give hereafter? If you cannot bear some drops of God's wrath now, what will you do when the full vials of God's wrath shall be poured out upon you, if you be found under the guilt of sin? If you cannot endure the sparks of hell-fire, how will you endure the flames, and most burning heat thereof? If the forecasts of hell affect your heart with such horrour, and the fears of it fill the spirit with such amazement, what will hell itself do when the pains and anguish thereof are beyond the greatest fears, and highest conceptions of it? Should you fall into the hands of the most cruel men to torture and massacre you, this would be fearful. Should you fall under the power of devils to tear and rend you, this would be more fearful. But to fall into the hands of God, this will be most fearful. This you cannot bear. And yet if you are wicked, you must bear it, and that to eternity. And can you sleep still in sin, under the thoughts of such danger? Secondly, Consider the sureness and unavoid-ableness of hell-fire. Nothing is more sure than what God has revealed in his Word, and nothing more unavoidable than what God has threatened; and such is the tormenting of the wicked and ungodly in the flames of hell-fire. While you are here upon the earth, there is a possibility of escaping future torments. Pardon, peace, and salvation are attainable. If you lay your sins to heart, if you confess and forsake them, you may find mercy. If by faith you apply yourselves unto the Lord Jesus you shall not perish but obtain eternal life. But if go on still in your trespasses, if you live and die in a state of impenitence and unbelief, it will be impossible for you to escape. Indeed could you make your party good against God, could you gather forces together, and wage war against heaven and obtain the victory, you might avoid the threatened punishment. But alas God is infinite in power, and will not permit any such attempts. You will not be able to hold up your head or hand against him. Who can stand in his sight when once he is angry? God will bind all the devils and wicked men and women together in chains of darkness, stronger than any iron chains, and none shall be able to make any resistance. Could you hide yourselves at the last day from his eye; could you fly from his presence into some remote corner, could you creep under some rock or mountain, and there be covered from his view you might think to escape. But this cannot be. God's eye will follow you, and his hand will reach you whither soever you go. Could you by your prayers and tears move God to compassion, and prevail for mercy as now you may do, there might be some hopes of avoiding this punishment. But soon God's ear will be shut, and the doors of mercy shut against you forever. Your knocking at the door will be in vain. It will never be opened. Your cries and prayers will be to no purpose. They will receive no answer. Hereafter the punishment of hell will be unavoidable by the wicked. Thirdly, Consider the nearness of this punishment of hell. The sands of your life are running swiftly. The time of your abode here is wasting very fast. Your bodies will quickly be in the grave, and if you die in your sins, your soul will be as quickly in hell. You cannot long escape this punishment. You may shuffle the thoughts of God and future wrath out of your mind for a time. You may busy your thoughts about other things while you are here. But all these things will shortly shrink away from you, and leave you naked, and you must stand before God to be judged by him, and to be condemned by him, and to be punished by him. God will meet you as a bear bereaved of her whelps, and rend the caul of your heart, or like a roaring lion, and tear you in pieces; when there shall be none to deliver. God will take you into his hand, and throw you out of his presence into the bottomless gulf of unquenchable burnings. I think this should awaken you. Fourthly, And lastly, consider the everlastingness of hell-fire, and your torment which there you must endure, if you be found in the number of unbelievers. The wrath of God will never be at an end. The worm of your conscience will never die, and the fire of hell will never go out; but the smoke of your torment will ascend up forever and ever. When you have been the space of as many years in hell, as there are stars in the firmament, as there are drops of dew upon the earth in the morning, as there are spires of grass which spring out of the earth, as there are drops of water in the ocean, as are there sands upon the seashore, your torments will be as far from being aswaged, and as far from being ended, as at the first minute of your entrance into this dreadful place. As there is an infinite space of place (if I may so call it to help our apprehensions) beyond the circumference of the heavens, and the visible world in comparison with which ten thousand millions of worlds would not fill up the space of the least speck: so there is an infinite space of duration beyond the circumference and bounds of time in comparison with which the duration of ten thousand millions of worlds for ten thousand millions of years, would not be so much as a minute, or the least imaginable instant. And this whole eternity you, if wicked, must spend in extremity of torment. The real length of eternal torment cannot be measured, and the imaginary length will be greater (if I may so say) because of your misery. If a short time of misery here on earth seem long, what will an eternity of misery seem to be in hell? When the body is in health, and the soul is sweetened with delight, time steals away insensibly, years seem months, months weeks, weeks days, days hours. But when the body is sick and the soul embittered with sorrow, a short time seems long, and it passes away slowly in our apprehension. Hours seem days, days weeks, weeks months, months years. How do we count the clock, and reckon the sands that fall in the glass, and time seems to have a leaden heel. How long then will the eternity of misery in extremity seem to be? I believe that the space of one quarter of an hour in hell will seem longer to the damned that a whole life of misery in this world. Yes, I think I may add that a minute's pain in hell will seem longer to the wicked than a thousand years of pleasures in heaven to the righteous, who will sweetly pass forward in the infinite duration of joy, without the least trouble or tediousness. So that the eternity of misery in hell will be as it were a double, triple, yes thousand-fold eternity. I think these considerations should startle all you that are asleep in sin. I think they should make your hearts to quake, and every joint to tremble. I think the sinners in Zion should be afraid and fearfulness should surprise the hypocrites, and I should hear some of you cry out, as Isaiah 33:14. Who among us shall dwell with devouring fire? Who among us shall inhabit everlasting burnings? and as the jailor in Acts 16:29, 30, when awakened by the earthquake, and the impression of guilt was made by God upon his conscience: Sirs, what shall we do to be saved? Such of you as are righteous through the perfect righteousness of Christ made yours by faith, without the imputation of which (whatever righteousness you may have within you, because imperfect) it is impossible you should escape the damnation of hell; you that are clothed with the white robes of Christ's righteousness, under which all your iniquities are covered, and with all have the spirit of Christ given unto you, to work you into a conformity unto the image of Christ in your regeneration and sanctification, which are inseparably joined unto justification by faith; you may take comfort in this Doctrine, which is matter of such terrour unto the wicked and ungodly. As in Samson's riddle, out of the strong and fierce lion came forth honey and sweetness: So this Doctrine which looks with such a fierce aspect upon those which are out of Christ, yet will yield sweetness unto you which are in him, because there is no condemnation unto them which are in Christ Jesus, Romans 8:1. Because Jesus has delivered you from the wrath to come. I Thessalonians 1:10. Who shall lay anything to your charge, when God has justified you? Who shall condemn you when God has acquitted you? Need you value then the wrath of men, when you are delivered from the wrath of God? Need you fear mens' threatenings of temporal punishment, which can reach no farther than the body, when you are delivered from condemnation to the eternal punishment of soul and body in the lake which burns with fire and brimstone? What does it matter though you should lose your estates, since you are not in danger of losing your souls? What does it matter though you should be thrown into a prison on earth, since you are not in danger of being thrown into the prison of hell? You may take comfort and the consideration of this may alleviate all your fears and grief upon the account of any pains and afflictions, which in this life are upon you, or you are in danger of. You may say of them all, these are not the torments of hell. These are light, the other heavy; these short, the other eternal. Lift up then your heads with joy. Yet a little while and you shall see what a difference the Lord will put between you and the wicked. When they shall weep, you shall laugh. When they shall mourn, you shall be glad. When they shall cry and howl, you shall sing and leap for joy. When they shall go with fighting to hell, and everlasting horrour in their hearts, and all mirth and joy shall flee away from them forever; you shall come with singing to heaven, and everlasting joy in your hearts, and all sorrow and mourning shall flee away and never any more be found. And now sinners what will you do? Will you dare to go on in that broad way of sin, which before long will open under you, and let you down into the horrible gulf of unquenchable burnings? Can you be contented with a portion in this life, and to receive all your good things here, when fire andbrimstone, and everlasting burnings shall be the portion of your cup hereafter? Will any pleasure of the flesh and sin for a season countervail that everlasting pain and misery, which will be the bitter fruit and consequent of them? Let me therefore exhort you without any delay to come out of the broad way of sin. It is the way of hell, and will you proceed any further in it? You that are profane and unclean, you that are swearers, Sabbath-breakers, scoffers of religion, persecutors of God's people, drunkards, covetous persons, yes, all you that are hypocrites, that are impenitent and unbelieving persons, give me leave to stop you in your course, or rather hearken unto the voice of God in his Word, who calls you to turn from your evil ways, that iniquity may not be your ruin. Come out of the broad way, and get into the narrow way. It has a strait gate, namely the gate of regeneration. This you most pass through; you must become new creatures, get new hearts, and lead new lives. You must walk in the narrow way of mortification, self-denial, new obedience, otherwise you will certainly be numbered among the damned, who will be everlastingly burned in the fire of hell. The passage is difficult, and the way narrow, but both are necessary. It is the passage from death to life, and the way from hell to heaven.